Parliamentary panel head says 6-month-old report not being implemented. 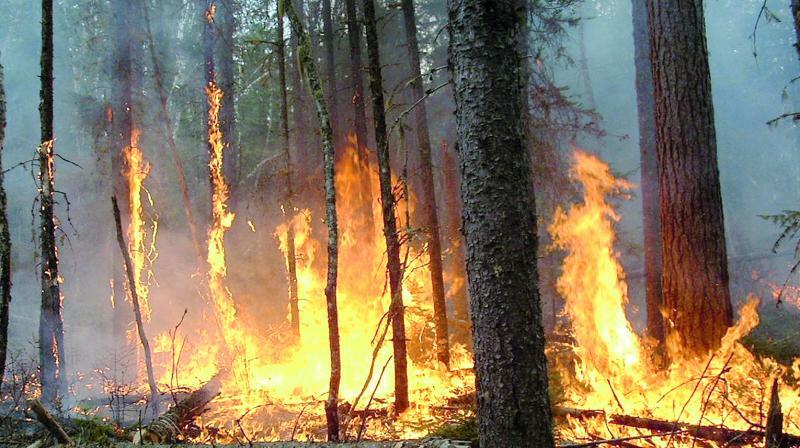 Close to 20,000 forest fire incidents are reported annually in the country. New Delhi: Prevention of forest fires and the resultant climate change do not appear to be high on the agenda of the Union ministry of environment, forest and climate change, the head of the department’s parliamentary panel has said, complaining of a cold response from officials to its suggestions on the issue. A six-month-old report, offering steps on mitigating forest fires, has allegedly not been implemented in right earnest. “In the coming days, I am planning to write to the ministry and seek a more responsible and quick response on the report that we gave in December 2016,” said Renuka Chowdhury, who heads the parliamentary standing committee on science and technology, environment and forests. “All we get is a standard reply, ‘We are preparing a report to be presented before the committee’, which I find inadequate,” said Ms Chowdhury, whose report Forest Fires and its Effect on Environment, Forests, Bio-diversity and Wildlife and remedial/preventive measures has allegedly evoked “bizarre diversionary” official response, so far. Every year, close to 20,000 forest fires are reported in the country. Forest fires cause serious health hazards by producing smoke and noxious gases. Apart from loss of timber, bio-diversity, wildlife habitat, these infernos also add to global warming. According to a Forest Survey of India report, about 50 per cent of forest areas in the country are fire-prone. The parliamentary panel’s chief said her latest report underlined the need for putting in place a quick response system for fighting forest fires, infusing technology and involving the local community in fire fighting. Ms Chowdhury’s displeasure over slow action-taken on the report comes in the backdrop of the government recently backing the Paris Agreement on Climate Change and committing itself to fighting climate change. Sources in the parliamentary committee alleged there was a lot of “hypocrisy” and “mismatch” between words and action of the government functionaries on environment issues. The parliamentary committee’s report underlined the need for a faster response to jungle fires and involvement of the local community as the first line of fire fighters. “The people who benefit from the forest should be the first ones to swing into action in the event of fires. Why should they wait for the National Disaster Response Force to come and start dousing the fire?” said Ms Chowdhury. Former director general of Indian Council of Forestry Research and Education, V.K. Bahuguna, agreed with the urgency shown by the committee. “We need to implement proposals prepared by scientists like me to put in place early warning systems in forests,” Mr Bahuguna said. Earlier, seeking a proactive approach from the ministry, the parliamentary committee asked the government to draft a national policy on prevention f forest fires and start “assessment of loss of bio-diversity due to forest fires”. It asked state governments to train fire brigade staff to fight forest fires, set up toll-free helpline for people to report fires and endorsed suggestions of the Indian Institute of Remote Sensing (IIRS) to give mobile apps and geospatial tools to forest rangers, school children and villagers for monitoring forests.